When is Stitch Witchery Allowed? There is a lot of back and forth about when Stitch Witchery is allowed to be used in bridal. I feel that there are a few different ways to look at the use of this product. First, I will explain what is flat-out wrong. 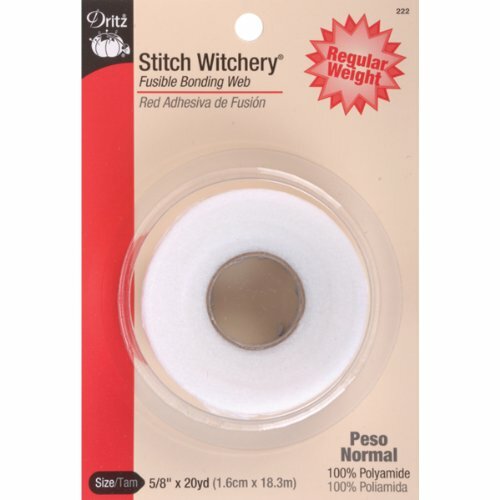 A bridal seamster should never use Stitch Witchery 100% in place of sewing. For instance, if you have lace appliqué that needs to be attached down the side of a gown, you cannot just glue it down with the fusible tape and call it a day. When she dry cleans the gown, the lace will fall off. It is also not heirloom quality work. Now, I'll share with you how I feel that it can be used correctly. I use it as a stabilizer to shape and hold the appliqué while I hand stitch. You can get by with slightly fewer stitches with this method, but you need to make sure the stitching is adequate. I also clear the use of fusible adhesive with my bride before using it. I explain to them that it will cost a little less if we use it, because the hand sewing will go faster. Below, you will find the latest video where I demonstrate the use of stitch witchery as a stabilizer and also hand sewing. Below that, you will find a purchse link if you are looking to try some. Here's the product on Amazon. It is super cheap and handy! I usually buy a larger roll than what this links to, but it's the same idea! I hope this has helped!